We are now deep into winter, and most likely you and your family have already been through a couple rounds of the common colds and flu. What simple tasks can we do to cut down on these inevitable illnesses? There are a lot of home remedies and folklore about preventing the common cold, but let’s review the best, evidence-based preventive tips. One interesting idea is daily gargling, with simple salt water, during the entire winter season. In a 2005 published study in the American Journal of Preventive Medicine, people who gargled up to three times a day had a 40% decrease in respiratory illness and symptoms during the winter. Gargling also is a simple way to help improve sore throat pain and swelling, and it also loosens up mucus. Another method with good evidence is a daily supplement of vitamin D, for all ages, during the entire winter season. Daily year-round doses of vitamin D (400 IU for children) are already recommended by the American Academy of Pediatrics. A recent study published in the American Journal of Clinical Nutrition showed that schoolkids who took a higher dose of vitamin D during flu season had a 42% decrease in influenza infections. Your local clinics should have vitamin D in stock; I recommend 1,000 IU daily for adults. Don’t forget the simple things as well; simply getting a good night’s sleep can decrease your risk of infections. This has also been studied recently, in a fascinating experiment published in 2009 in The Archives of Internal Medicine. In this experiment, researchers literally injected the common cold rhinovirus into people’s nostrils and measured who got infected, then compared this to their previous sleep habit. Those who slept only 6-7 hours a night were three times more likely to get cold symptoms than those who had 8 or more hours of sleep. This study literally proves what we all assume — that proper sleep is crucial for our immune system. Perhaps those of you who feel you “always get colds in Beijing” should check into your sleep patterns! Another very common sense preventive measure is hand washing. Last year’s H1N1 scare has really improved awareness all over China, and it’s much more common now to see alcohol gel hand-wash dispensers in schools, malls and restaurants. I think this is a great and simple idea that really does cut down on passing along the infection via handshaking or touching. People should not waste their money on the anti-microbial soaps as they don’t have much evidence of effectiveness, and they likely will lead to a worsening of the already serious worldwide problem of antibiotic resistance. Simple soap and water also does the trick — but I actually prefer the alcohol gels as they work quicker and wipe out a much larger percentage of viruses and bacteria than soap. 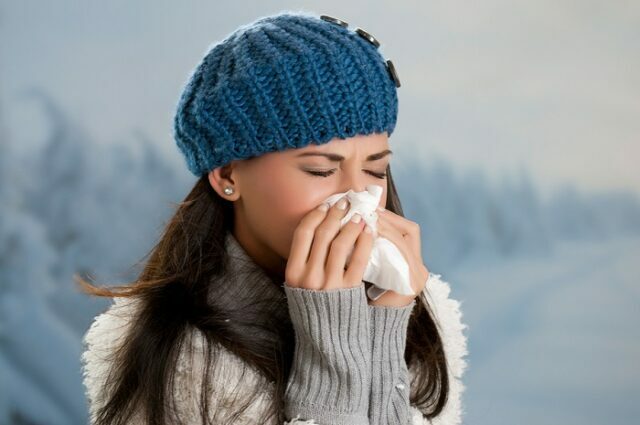 What about natural medicines for colds and flu, including the commonly used vitamin C, echinacea, and zinc? The best evidence so far is still fairly conflicting, and the online Natural Medicines Database lists all three as “likely safe” but “possibly ineffective”. Another major key to prevent the winter flu (but not the common cold) is the annual flu vaccine. As I mentioned in BeijingKids a couple months ago, this vaccine can lower your chances of infection, as well as prevent you from infecting loved ones and colleagues. It’s not 100% effective, but I feel the benefits far outweigh the risks. Those of you with any contact with newborns and infants under 6 months of age should seriously consider getting the vaccine for yourselves as those infants are most vulnerable to the flu, and they are not eligible for the vaccine. It’s not too late to get the flu vaccine, as flu season can run into late spring. All expat clinics have the vaccine in stock, which is usually available at a small charge of around 120RMB.